Why Trust Is So Important in International Real Estate Sales? What is the most essential ingredient in being able to close the real estate deal with a foreigner eventually? Let's put ourselves in the shoes of a foreign buyer for a minute. He or she is many hundreds or even a thousand miles away from a property in your country where they are going to find a bargain of their dream real estate. What is the first logical thing to do for them? Of course, to research their potential real estate best buys on the internet. By the way, the foreign buyers will search the internet from their own country the usual way they do searches every day on any other issues, which means that their computers will open a search engine in their own country language - and you have to be seen over there with your properties and/or services! The real estate potential buyers from overseas must perceive your online information as detailed, reliable and truthful first of all, otherwise they will not trust you with their business even at this early stage and will be fast to move to other sites and properties for sale. 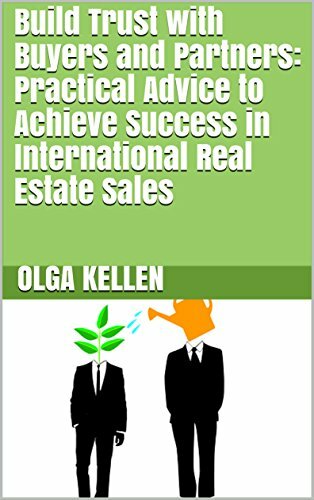 The e-book Build Trust with Buyers and Partners: Practical Advice to Achieve Success in International Real Estate Sales is a Quintessence of how to sell real estate to international buyers. In a nutshell: Establish trust with your potential overseas buyers (and foreign realtors if you want to involve them), and your international real estate sales will flourish. - What are the major ingredients in building trust? Note: let's acknowledge that if you follow this e-book's advice even to a dot, you might not be able to achieve all your real estate selling goals in a particular situation as fast as you maybe planned (as many various factors play their own role in the market simultaneously). However, if you do not establish trust with the overseas buyers and partners, then you will not be able to get successful international real estate sales, that's for sure. Note to realtors and developers with many properties for sale: yes, you will need to put some effort in establishing trust with the buyers and partners at the beginning, but later the first happy overseas buyers of yours will send their friends and families your way - absolutely free of any charge or work for you - smile!